Simple Candy Making Tips will help you prepare delicious homemade candy with as little fuss as possible. Knowing these secrets will allow your candy making to be a delightful experience and a whole lot of fun. First of all, what exactly is classified as candy? Simply put, candy is a combination of sugar, liquid, and flavoring that is melted to a high enough heat to cause it to solidify. The higher the heat, the harder the candy. That's a simple rule of thumb that you should keep in mind. Of course, if you go too hot you can burn certain types of candy, so be careful. That's the science out of the way. Let's get into the good stuff! One of the most important candy making tips is to understand the affect of humidity. Humidity can cause candy and sugar to soften. If you are battling humidity or rain and can't bear to wait for a cooler, dryer day to indulge in a bit of candy making, never fear. You can compensate by allowing some of the moisture to evaporate by cooking the syrup to two degrees higher than directed. High altitudes cause candy to cook at a faster pace. For every 500 feet you are above sea level, you should cook the syrup one degree less than directed in your recipe. If we attempted a little candy making while flying, I wonder if we'd have to cook it at all!! Only use butter when making candy. It adds its own good taste. The only exception to this rule is when melting chocolate. Butter and margarine may contain water. It is important to never get moisture in the melting chocolate. 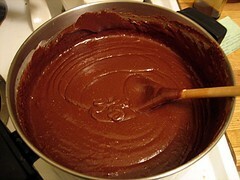 Instead, use shortening if necessary to help along the melting process and to keep the chocolate from lumping. Organize your candy making equipment before you actually begin. The process moves along at a rapid pace. You will do yourself a great favor if you have all of your tools within easy reach. Place a tray next to the stove to hold your wooden spoon, candy thermometer, cup of cold water, saucer for catching drips, and pastry brush, if needed. Have a rack or cooling surface nearby and all your ingredients ready to go. Never double a recipe when candy making! 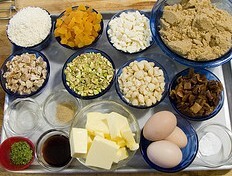 If you need to make large amounts, prepare separate batches. Just think of how many times you will get to lick the bowl! If your recipe calls for you to cook the candy to a specific temperature or stage, be sure to watch it carefully. 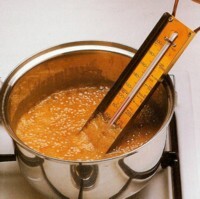 Use the cold water test if you don't have a candy thermometer. Be sure to stand your thermometer upright in the syrup. The base must be in the syrup, not just the bubbling foam. Don't allow the bulb to rest on the bottom of the pan. Thermometers must be warmed up gradually to keep them from cracking - kind of like some people. Test your thermometer regularly to be sure that it is still accurate. Put it in a pot of water and bring to the boil. Water boils at 212 degrees. If your thermometer is off, remember to adjust the recipe temperatures up or down as needed. The best way to clean a saucepan after it has been used for candy making is to fill it with hot water right away and allow it to simmer on the stove until all of the syrup has dissolved. I must admit that clean up is not my favorite past time; I'd rather eat the treats. However, I do love the sense of satisfaction that I get when the kitchen is clean and everything is back in its place. To keep from getting overwhelmed I generally make a habit of putting ingredients away as soon as they are used. I also fill the sink with hot soapy water just before I start so that I can drop the sticky tools in them when their job is done. These candy making tips probably don't seem like much. If you put them in practice, I guarantee you will have much greater success. The number one greatest candy making tip is to follow the instructions exactly!